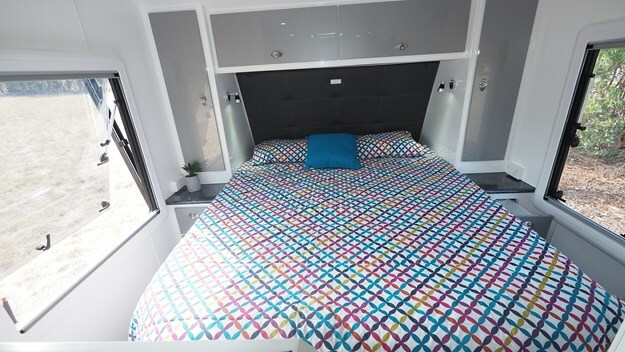 Highline Caravans has been building its range of vans for only five years, but the two brothers behind the brand have years of experience in the caravan industry. With a team of a dozen workers, including two-full time draftsmen, they have established a niche market for themselves by offering great looking, semi custom models at a very competitive price point. Now there are with eight vans in the range, five of which are offroaders, including this single-axle Enforcer. With a name like Enforcer, this 5.3m (17ft 6in) offroad caravan has a lot to live up to, and it needs to be capable and tough-looking to carry it off. As far as looks go, the compact Highline is already on the right track with its tall stance and lots of rugged appeal. Walls are clad in smoothly finished silver Probond composite panels over a black checkerplate lower covering, and there is the choice of bright tones including blue, orange, green and blue for the primary colours. Orange rock-sliders forward of the wheels, orange trim on the wheels themselves, on the brake drums and suspension all add to the Enforcer’s appeal. But the quality of a van is more than how it looks. When we visited the Campbellfield factory for our review of the Enforcer, we were impressed by the enthusiasm and friendliness of the staff working on the vans. 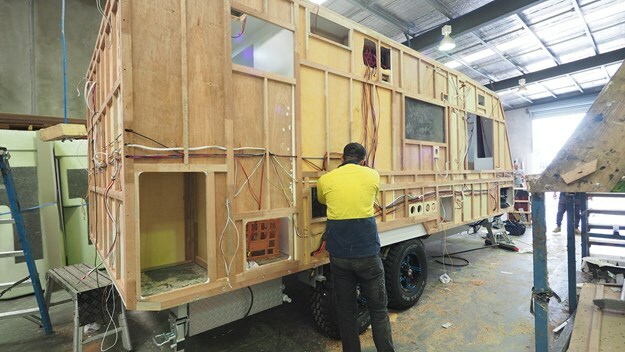 And, with a number of models on the assembly line, it was refreshing to see that the well-finished look of the Meranti framed vans in production is reinforced by close attention to detail including how the furniture is installed and how well the insulation is completed. 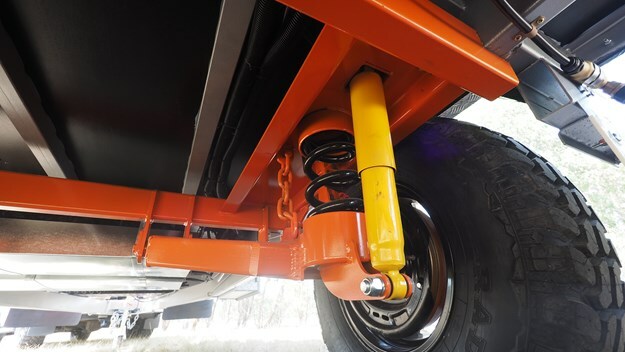 Built on a 6in Roadrunner Duragal chassis and A-frame, the rig is supported by Oz Trekker independent trailing arm suspension with twin shock absorbers each side on a set of striking black and orange 16in alloy wheels shod with 265x75 all-terrain tyres load rated to1350kg each. This setup adds up to loads of ground clearance and helps get underbody water and electrical systems high out of harm's way. A 95L water tank and a 95L grey water tank are part of the standard package, but most owners heading to faraway places would option in a second water tank. It should be no surprise that the tow point is a DO35 from Cruisemaster, as this hitch is a favoured accessory for its extensive articulation and positive locking mechanism. 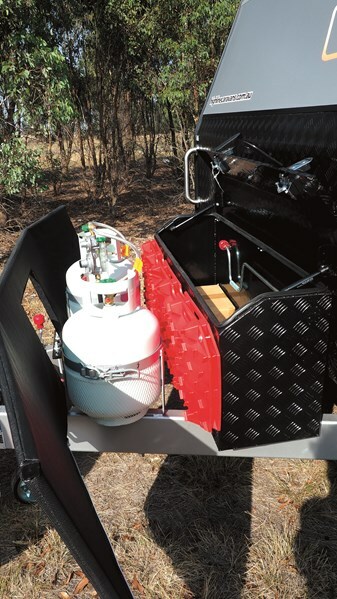 The extended A-frame supports a heavy-duty 8in jockey wheel, and a full-width stone guard ahead of two 9kg gas bottles and a black checkerplate toolbox with a pair of Maxtrax attached. 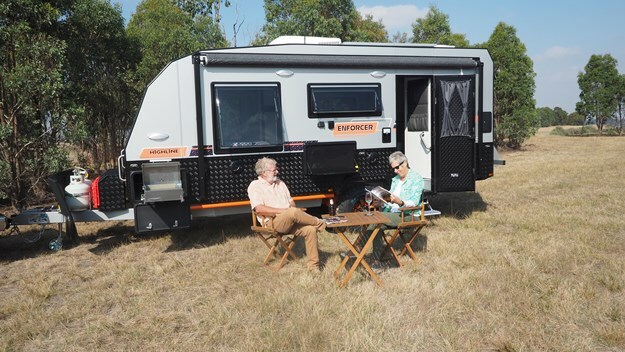 Our Enforcer is well rigged for outdoor living with a slide-out Bushman RV Explore BBQ, picnic table, a pair of waterproof outdoor speakers, an outside shower, overhead LED lights and a full-length ATRV awning. Down the back, a couple of Highline embossed jerry can holders sit aside the high mounted spare wheel while a shovel and a high lift jack mounted on their own sturdy mounts are a practical and robust looking addition. Entry is towards the rear, over a folding 200kg rated step and through a Camec three-way door to an inviting interior. To the right is a complete ensuite, while forward is the living space with a north-south double bed with pillow-top mattress up front. Furniture is produced in-house in the traditional way, using lightweight ply where possible to keep weight down. Gloss painted, flush cupboard doors and drawers have a modern appeal and are finished with close tolerances and quality piano hinges and latches. Along the central section is the driver’s side kitchen with a bench leading back to a two-door 184L Dometic fridge-freezer. Arguments can rage about what’s the best system for refrigeration, with many claims that 12V compressor fridges solve all problems, but there is still a school of thought that a gas system will sustain you in a week of bad weather when solar will struggle to charge the batteries. There is probably no definitive answer for everyone, but I’m happy that the three-way gas-electric is a good compromise for extended travel. 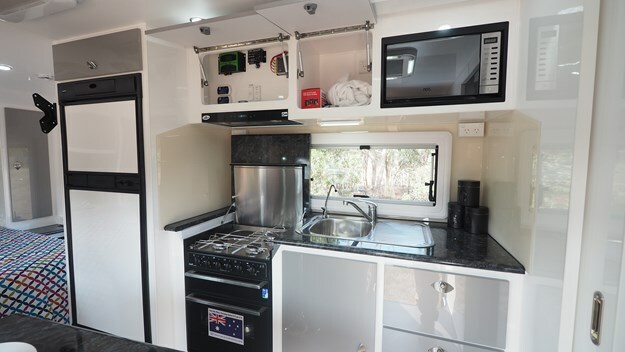 The Swift 500 has four burners, a grill and a full oven, which is a bonus for those who like the idea of a roast or a loaf of bread on a winter’s night when cooking outside on a camp oven would be less inviting. Storage space in a compact van with an ensuite is always limited, but overhead and bench cupboards and drawers are backed up with an area under the dinette bench for enough dry provisions for a few weeks away. An L-Shaped lounge wraps around a laminate table with a grey stone finish. The dinette has room for three and also offers a feet-up position for one and is covered in quality dark grey vinyl with comfortable padding. Windows at the dinette, the kitchen and either side of the bed combine with two Ranger roof hatches for light and ventilation with a Houghton Belair 3400 air conditioner as a backup when hooked to 240V power. 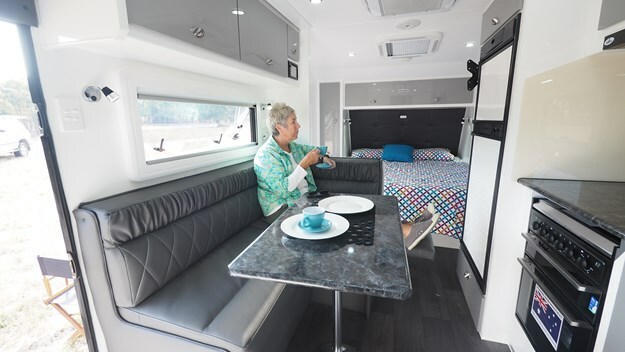 A quilted bedhead adds to the homely feel of the van, and there is the usual complement of bedside tables, hanging and overhead cupboards, and reading lights as well as a nearby bracket for the 24in television. Down the back is a full-width ensuite complete with an NCE 3.2L washing machine and decent sized vanity with a floating bowl and a big mirror. Roof hatches in both the main room and shower provide proper ventilation, and there's a double 240V powerpoint. The sliding door has a towel rail, and I noticed extra hooks and a handy toothbrush holder. A 150W solar panel charges a 100Ah battery, giving enough power for lights, pumps, the TV and stereo, while LPG gas runs the fridge and cookers. So, if you are frugal with water, there is no reason why you couldn't stay off-grid for extended periods. Pricing starts at $61,990, so the compact Highline is excellent value for a capable and well-equipped offroader. 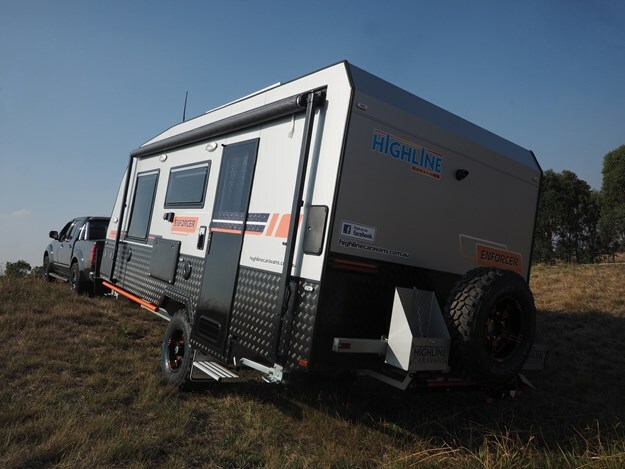 Highline specialises in customising its standard package to customers’ needs, so you could easily add in an extra water tank, solar panel and battery for more adventurous travel. The Enforcer has all the benefits of a compact van without missing out on the necessities of long-distance treks over rough ground. A smaller, lighter van is more straightforward to tow, better in the bush in tight or muddy situations and cheaper to maintain and run. At the same time, there’s enough room to be comfortable inside, so there’s no reason a couple couldn't do a lap of the country and still be talking to each other when they got home. Compact size for easy towing and bush travel. Compact vans have less storage space.